Saturday Cycle: Nenagh – Dolla – Silvermines – Shallee – Newport – Birdhill – O’Briens Bridge – Dalys Cross – Chapel Hill – Birdhill – Yellowbridge – Coum – Portroe – Ballina – Four Sisters – Nenagh. 68 mls. Pool at 7.30am. End of Year Cycle: We have decided to move the End of Year Cycle to Sunday, Sept 8th. The reason for this is to allow people to take some time-off from cycling to recharge their batteries before returning to action in October. People have trained hard all year so we are going to try and finish up with a big one. Don’t worry, ye will all be well able for it. Dan Hogan has kindly agreed to tow a maximum of 6 around if you find it too hard. Start time: 10:00am, Sunday, Sept 8th. Incentive: The club will reward everyone for supporting the club cycles all year by supplying all the food at the food stop. 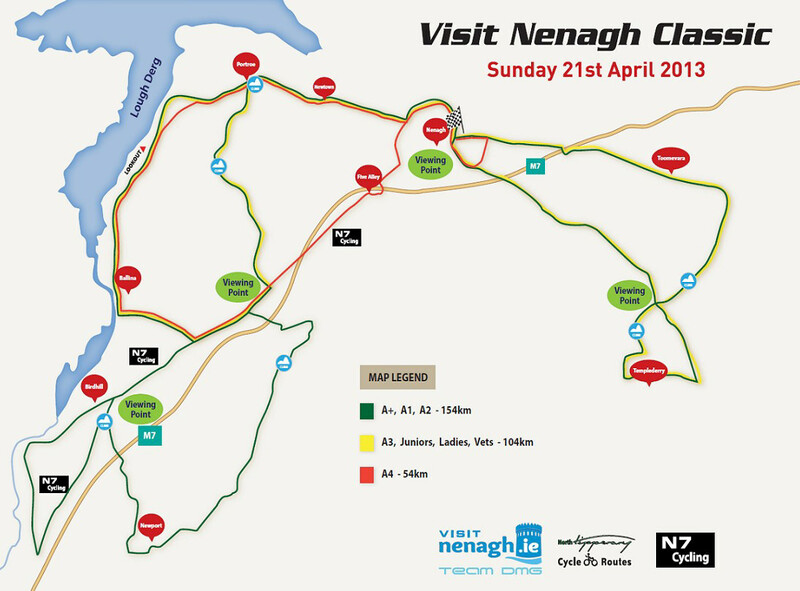 Route: Visit Nenagh A1/A2 Route – Nenagh – Portroe – Ballina – Four Sisters – Silvermines Road turnoff – Shallee – Newport – Birdhill – O’Briens Bridge – Dalys Cross – Chapel Hill – Birdhill – Yellowbridge – Coum – Portroe – Nenagh – Latteragh – Templederry – Currabaha Cross – Latteragh – Seanins Hill – Toomevara – Nenagh. Top Scorers: Eoin Woolley 406, Eoin Sheehan 399, Ronan O’Driscoll 397, Eoin O’Donoghue 312, John Ryan 311. Top Scorers: Sinnead Oakes 499, Cliodhna McGrath 358, Geraldine Kyne 344, Sinead Kennedy 267, Majella Moyles 261, Anita Egan 235. Top Scorers: Sinnead Oakes 499, Eoin Woolley 406, Eoin Sheehan 399, Ronan O’Driscoll 397, Cliodhna McGrath 358, Geraldine Kyne 344.